Ensure that there are no delays in your implementation by sending this today! Simply copy and paste the template below to the point-of-contact who will be providing the banking information. I just wanted to let you know that I've chosen you as the point-of-contact to provide Chiron Health our banking information. They need this information so that we're able to collect the patient payments from our telemedicine visits! This is an exciting step for us to be able to improve patient outcomes, increase practice revenue, and improve overall efficiency. 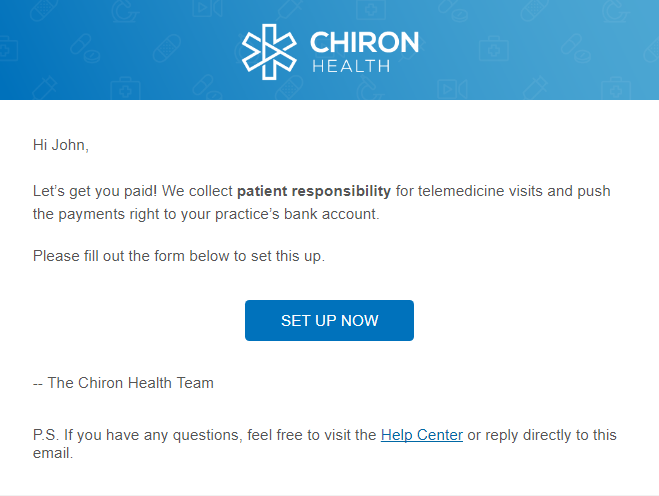 Very shortly, you'll be receiving an email from Chiron Health that will direct you to complete the Patient Payment form. This form is extremely simple and should take less than 5 minutes to complete. Without this information, we won't be able to collect the money that we charge for telemedicine visits.